How Do Composite Decks in Leesburg, VA Stack Up? Decks have become an extension of most homeowners in Leesburg, VA for play areas for young children, an outside kitchen for grilling, and a dining area for eating outside on paper plates, all of which save time in clean up. Finding decking material that will best suit your family’s lifestyle is as simple as a composite deck according to homeowners in Leesburg, VA.
Composite decks have come a long ways from the 1990s. As the wood fibers aged, the deck would show its age by a dull appearance in a short amount of time. If the deck endured long exposures to a wet environment, structural deterioration, mold, and rot eventually lead to deformations and structural failure in Leesburg, VA.
New technology has improved the look, feel, durability and overall quality of composite decks. With the newer technology, composite decks have become extremely easy to maintain, safer because there is no splintering or rotting, and it should last homeowners for decades without ever having to stain or paint it. All that is needed to clean a composite deck in Leesburg, VA is a little soap and water and a garden hose to rinse, and it should look as good as new for many years to come. Wood decks require hours and days of extensive labor every year. First, it has to be cleaned, possibly sanded, and then stained or painted to keep it looking great. Wood decks eventually will crack, twist, and splinter if not preserved with stains and paints on a regular basis. With a composite deck, there is no sanding, no staining or painting. It is about as low maintenance as you can get. This is the key reason why homeowners in Leesburg, VA pick composite decking materials for new deck construction. Unlike wood which is more prone to damage from weather, insects and normal wear and tear, composite decks resist these issues. 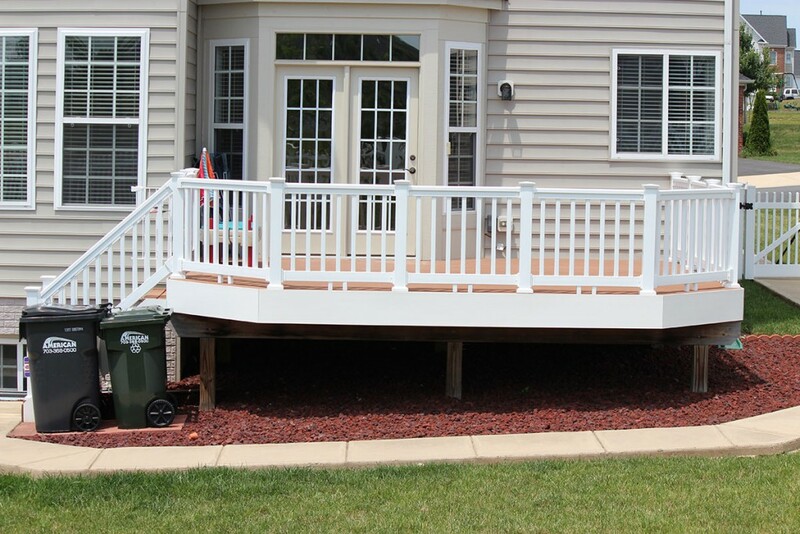 Composite decks are made from recycled materials, plastic and wood, which is encapsulated with an outer layer. This creates a hard, exterior shell that protects it from mildew, scratches, insects, UV fading and much more. Traditional wood decks last anywhere from ten to fifteen years whereas composite decks should last between 25 and 30 years or longer stacking up better for homeowners in Leesburg, VA. This entry was posted on Friday, March 3rd, 2017 at 4:02 pm	and is filed under composite deck. You can follow any responses to this entry through the RSS 2.0 feed. Both comments and pings are currently closed.